Wanna make your outfits more eye-catching and gorgeous? Change your shoes to bright ones! And today I offer your to pay an attention to metallic mules that will be perfect items for any outfits. This type of shoes is very popular right now among fashionistas and celebrities, so you can follow their examples to create fashionable and feminine looks. 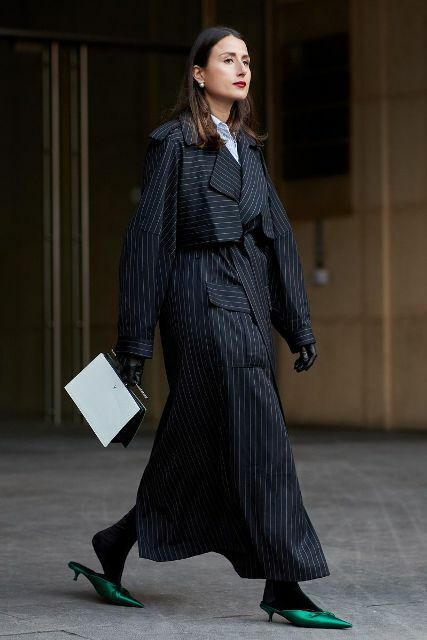 For casual outfits you can combine such shoes with jeans, culottes, pleated skirts, but for cocktail party or event looks try to pair them with ruffled dresses and suits. For more ideas you can look below. 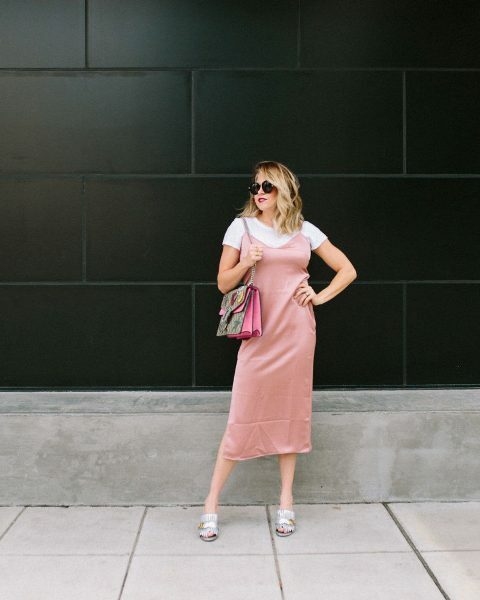 If you want to create a girlish and flirty outfit, then take floral culottes and combine them with a gray t-shirt, a yellow mini bag and silver mules. Or you can mix a yellow top with navy blue and yellow striped culottes, a denim jacket, silver shoes, rounded sunglasses and a metallic chain strap mini bag. 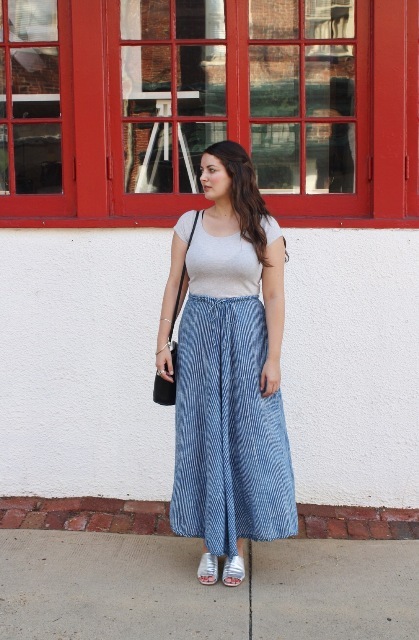 Want to find something unique and stylish? Then you can try to repeat a combination with skinny jeans, a white maxi dress (or a long shirt), a black clutch and golden flat mules. Or combine a printed t-shirt with a metallic blazer, a marsala bag, striped crop trousers, red framed sunglasses and silver heeled mules. For more official looks you can mix a white t-shirt with a beige blazer, crop trousers, a yellow leather bag and golden flat shoes. 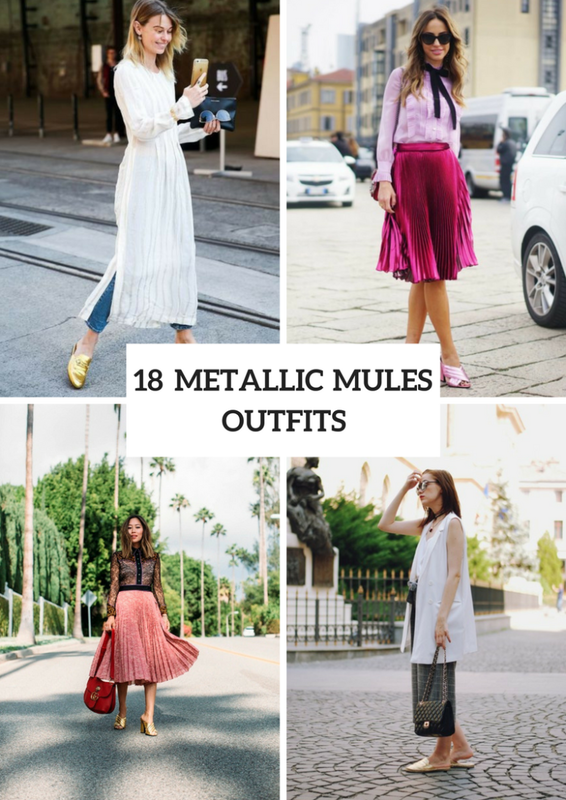 For making a feminine outfit you can combine a pale pink ruffled blouse with a black tie, a hot pink metallic pleated knee-length skirt (you can take a silver or golden skirt), metallic rose mules, a printed bag and sunglasses. Or try to mix a white t-shirt with a pale pink midi straight dress, a printed bag and silver mules.